When you contemplate whether something is a better deal because the initial cost is cheaper than the competition, to understand the true cost of ownership, you need to take into account the full cost over the lifespan of the product, including durability, reliability, and longevity, to get a full picture. For example, if we compare the high quality duplication grade Plextor PX-891SAF CD/DVD recorder drive with another common CD/DVD recorder drive that offers a slightly lower cost. 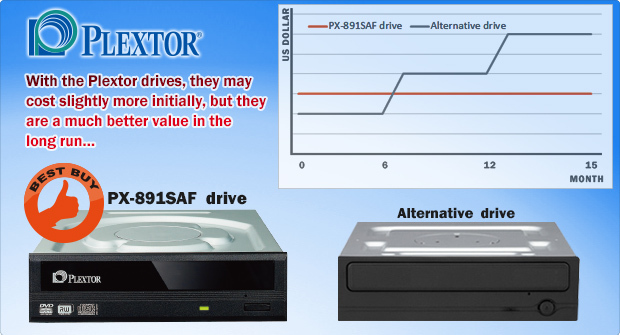 In this scenario, the alternative drive is $5 cheaper than the PX-891SAF, however, the alternative drive lasts only 6 months at most under the heavy duplication production, while the PX-891SAF lasts at least 12 ~ 15 months under the same production load. That means that you would have to purchase 2 ~ 3 replacements of the alternative drive over the lifetime of a single Plextor PX-891SAF drive. So that $5 initial savings is not only wiped out, but you end up paying nearly 2 times more for the alternative drive(s) compared to the PX-891SAF over the lifespan of the drives. In this scenario, I only looked at the true hard dollar costs of ownership, thereâ€™s also the issue that the PX-891SAF offers superior quality and less rejects than the competition. Thatâ€™s another cost that should be counted when determining the overall cost of ownership. Optical drives may not be very expensive and therefore you may not think itâ€™s worth doing a cost projection for them, however, when you consider the number of times you have to replace your drives, then youâ€™ll quickly realize how those savings can add up. 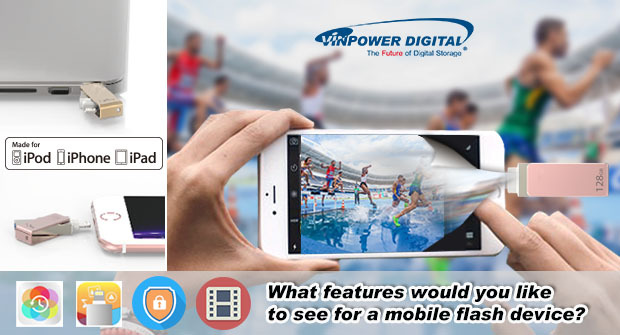 What features would you like to see for a mobile flash device? These are great features and in most cases would be all that’s needed, but we think many of you may have additional requests for features you’d like us to support. If you have a suggestion of what you’d like to see added to these Apple OTG devices, please contact us so that we can determine if those features can be added. Our goal is to offer a product that meets the needs of the users and this is your opportunity to have features that would be most useful for you, potentially implemented. Please reply with your suggestions or comments and we’ll work to add them. For more details about any products Vinpower Digital manufactures or distributes, please visit our website or contact a Vinpower representative in your area. Vinpower offers the ability to embed their secure high grade DVD video Copy Protection at no extra cost when using OptoDisc manufactured DVD media. In todayâ€™s savvy hi-tech world, consumers are often purchasing a single video and making copies for their friends which limit the overall sales. If you worked hard and put in a lot of effort and expense into creating your video project, you shouldnâ€™t be restricted in the number of units you can sell because you can’t afford the high price of replicated copy protection. Instead, by using Vinpower Digital’s CPS technology, you can feel secure by adding FREE Copy Protection with the OCP format in less time and with no minimum or maximum quantities required. Why should it cost you extra to protect what’s rightfully yours? 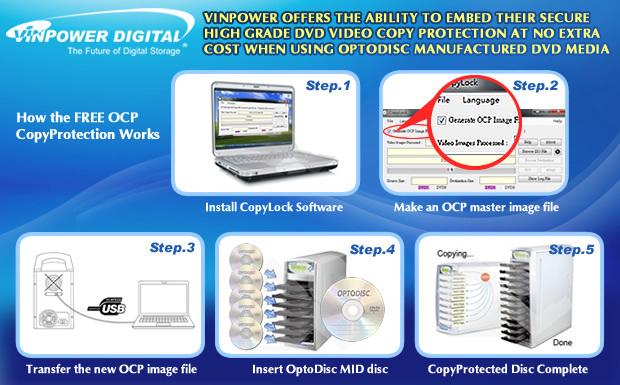 Keep the savings in your pocket and increase your revenue by adding Vinpowerâ€™s free OCP DVD video Copy Protection along with the superior OptoDisc manufactured DVD media. For more details about this product or any of Vinpower Digitalâ€™s range of hardware, software, and media offerings, visit our website, www.VinpowerDigital.com or speak with an authorized Vinpower representative near you. 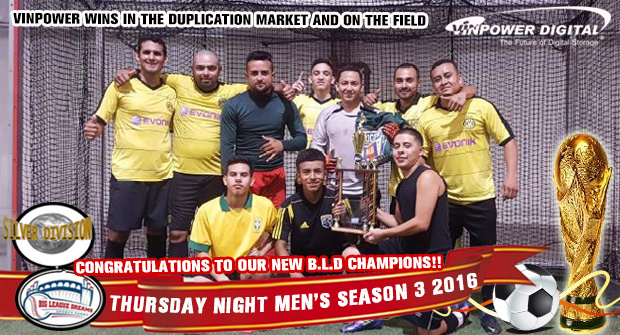 Vinpower would like to congratulate our sponsored Soccer/Futbol league champions for playing with the kind of tenacity and skill that Vinpower puts into our hardware and media. As a sign of support and admiration, we are dedicating our weekly email blast to our co-workers and friends that fought through adversity and became victorious!